The Nomad Concept creates attractive and elegant, translucent architectural sails. The sail sculptures integrate perfectly in a green environment. Stand-alone or fixed to the façade of a building, they are the ideal connection between inside and outside. They create extra living space outside the strict boundaries of the residence. 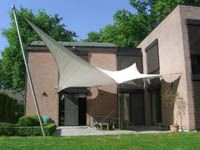 In the summer the sail sculpture offers a nice place in the shadow, on the terrace, at the swimming pool, in the garden. One can continue enjoying the beautiful green surroundings even during a small rain shower. In the evening, correct lighting on the sculpture creates a particularly fairy atmosphere. Please click on the banner down the screen to see different projects. With the right and left arrows you can scroll through different photos of each project.